The number two breakfast at Mart 130 was everything I hoped for, and I hoped for quite a bit. 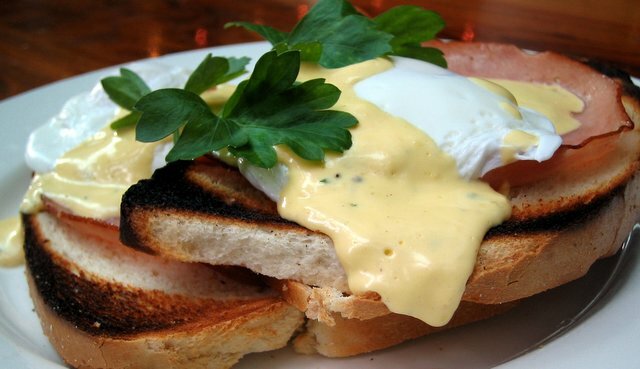 Perfect poached eggs. 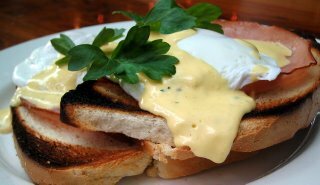 Excellent hollandaise. Fleshy bacon. And nice crunchy sourdough smeared with mushed up avocado. With number twos like this, it's clear why Mart 130 is number one. This morning, in an effort to re-connect with my inner-Pole, I had breakfast at Borsch, Vodka & Tears, 173 Chapel Street, Prahran, Tel +61 3 9530 2694. They do "modern Polish cuisine". They also do vodka. About 100 different flavours of vodka, much of it Polish, and much of it not available anywhere else (in Australia, that is). I decided vodka for breakfast wasn't such a good idea. Maybe next time. 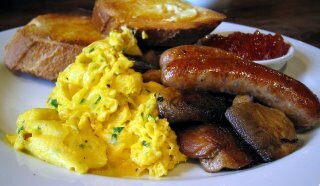 Polish sausage for breakfast, on the other hand, is a very good idea. 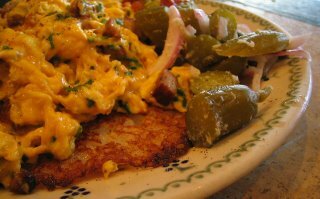 So I opted for the BVT Breakfast of scrambled eggs infested with bits of Polish sausage, on potato blintzes, and some chopped onion and Polski ogorki on the side. Most of it was very enjoyable, but the blintzes were a bit undercooked and gluggy. BVT gets bonus points for serving their food on authentic hand made Polish plates, even if they were very ugly hand made Polish plates. Dodgy-looking, isolated, public toilet blocks used to be the kind of place a young gentleman might go to meet another young gentleman for a bit of fun. The kind of place George Michael might hang out if he was in town. But nowadays, it seems, everyone is hanging out at the local toilet block, sipping soy lattes and showing off the latest thing in oversized sunnies. Kanteen, beside the Yarra just below Como park, was an early example of this trend. And thanks to its recent make-over, you almost forget there's a perfectly good block of brown-brick dunnies lurking beneath a designer layer of recycled timber cladding. Food-wise, the supersized Kanteen hasn't changed much from the original. Lots of stuff they can slap up quickly, like: ham, cheese and tomato melts on rye (with or without poached eggs); toasted pide topped with avocado and cottage cheese; and a breakfast pide stuffed with mashed egg, mayo, herbs, spinach and melted cheese (I had this and it was quite good). They also do Spanish Eggs baked in a dish with a couple of bits of chorizo, goats cheese and tomato sauce (and padded out with chunks of pide). 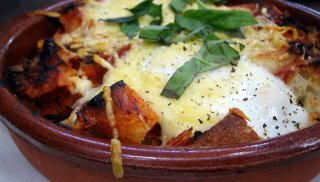 These are cooked (or reheated) in a big old Aga stove. But no bacon. Hello? No bacon? What kind of breakfast venue doesn't do bacon? 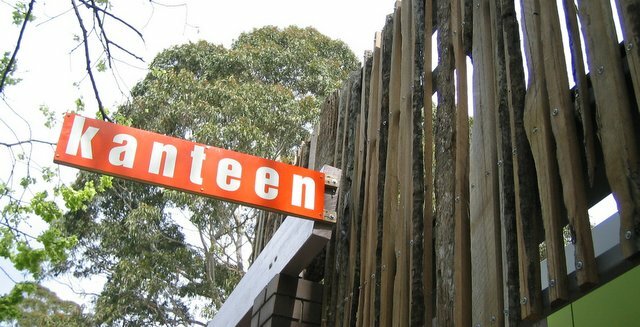 Kanteen does a decent Genovese coffee, plus you can get T2 teas, Emma and Tom's juices, and "Italian" hot chocolate. Service is still so-so, with the old get-your-own-water routine, and a long wait for coffees. Plus, they forgot the marscapone cheese on their own signature dish. It's surprising how rare it is to find a tea cosy these days. 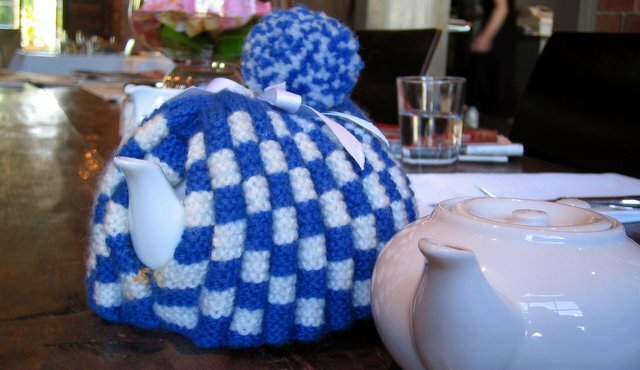 This little blue and white chequered number with a pom-pom on top had a certain law-enforcement chic to it. More importantly, it kept the tea warm. Which earns Annie Smithers a belated best tea cosy award for 2006. Never mind that it's the only tea cosy I've clapped eyes on during the past two years. It's also a very recent innovation. We were here only last week and the teapot was delivered stark naked. Maybe Annie's gunning for two chef's hats next year? 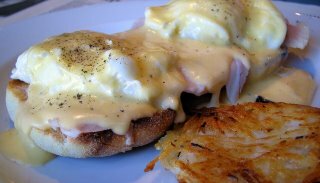 The eggs benedict was a top tier performance, if that counts. Good quality hollandaise and plenty of it. Magnificent ham. Well toasted muffins. Decent eggs (slightly over-runny for my taste). And a crispy house-made hash brown on the side. 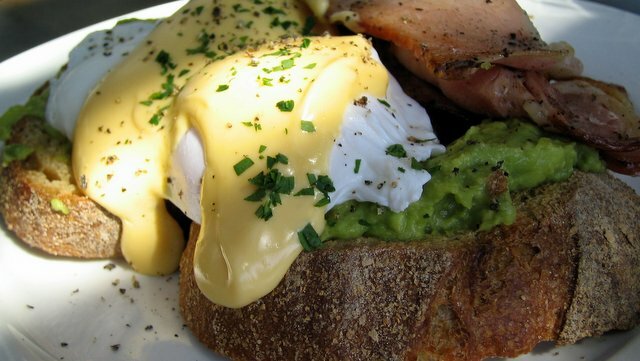 Well worth trying if you're cruising through Kyneton around breakfast time. Despite their flagrant disregard of breakfast blog regulation 101 - that spinach shall be served sauteed or steamed, never raw - this place does a pretty damn good breakfast. I was particularly impressed with the cheese and corn muffins. Ditto the cheese and ham snag. They don't just sell bananas at Fruits of Passion, 188 Bellair St, Kensington, Tel + 613 9376 8588. Maybe it was the "yummy dressing" that gave the raw spinach a lift? It was yummy. Or maybe it was the fact that I shoved the spinach under my steaming pile of scrambled eggs for some DIY wilting action? Whatever. It tasted good. As did the tasty relish on the side. 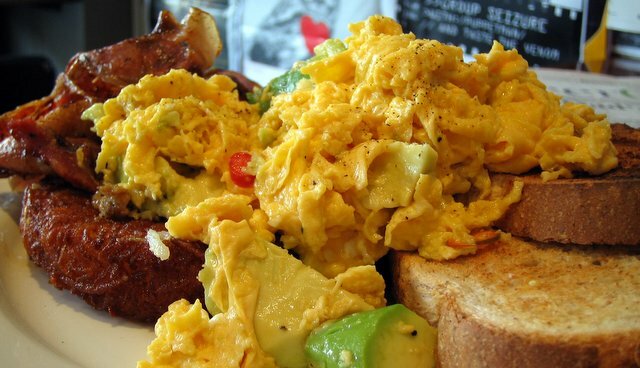 The Fruits of Passion menu is a little bit weird - scrambled eggs benedict, for example - but certainly not boring. 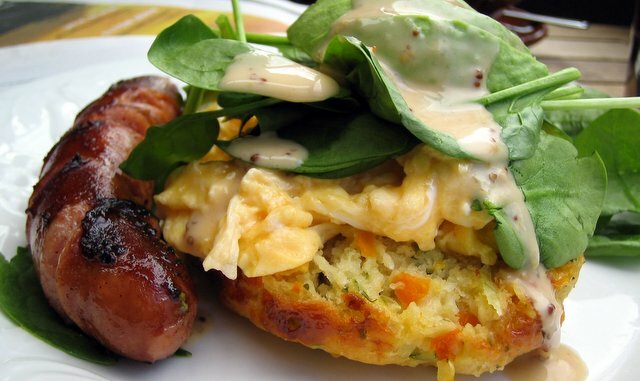 You can have "Skinheads on a raft" (baked beans on savoury scones), "Fat American pancakes", "awesome fruit toast", "yummy crumpets" with blackberry jam, or the "Vegetarian deluxe" eggs and extras. 15/20 "skinheads on a raft"
Coming from a family of francophiles I don't mind a bit of French here and there. A splash of pastis. A whiff of Gitanes. Some nice, greasy pork rillettes with cornichons. And I know enough schoolboy French to blurt out a few silly lines like "je parle Francais comme une vache Espagnol." Which means I know enough to spot a glaring error on "French" menu. Like a breakfast menu that says "Petit déjeuner carte". Merde! That is soooo not good grammar. I think you mean "Carte du petit déjeuner"
Annie Smithers may now be wearing a chef's hat for her food (and deservedly so), but she's flunking French big time. Oh well. Who cares? The food's great. The service is slick and friendly. And Kyneton makes for a very pleasant road trip. My serve of scrambles was a bit skimpy. But other than that I had no complaints. Possibly the worst place to do breakfast if you're a drug lord or an aspiring terrorist would be the Republic Cafe, 365 La Trobe St, Melbourne, +61 3 9670 2999. It's right next door to the Melbourne offices of the Australian Federal Police, and the place is crawling with G men. Last time I was here I enjoyed the kind of service that makes Qantas look good. But I decided it was time for a second opinion. Stephen Downes, for example, reckons Babka is "perhaps the best café in the known universe." Then again, Stephen Downes scored Vue de Monde 13/20, so maybe he's a few beans short of a burrito these days. 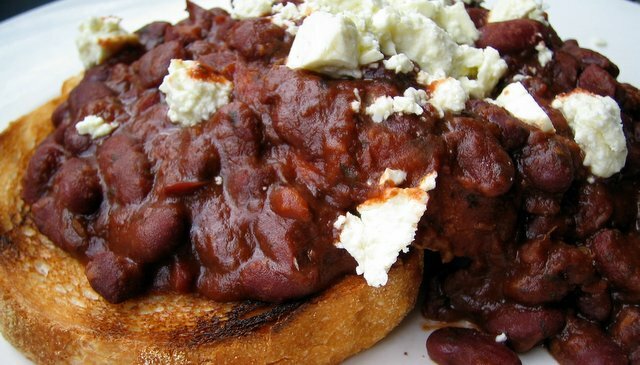 Speaking of beans, I'm pleased to report that the Georgian Baked Beans with crumbled feta are still the best in town. Perhaps the Milky Way? But is this really the best cafe in the universe? I think not. Service today was OK, but nothing special. We were attended to by at least four different people before the food had arrived, and they were all pleasant enough. Today's specials included a Croque Monsieur, which was actually a French toasted cheese sandwich. Sans jambon. Sans moutarde. So calling it a Croque was a bit of stretch. But it was quite a nice French toasted cheese sandwich nonetheless. Babka is also in the running for best graffiti, with some cute babushka dolls sprayed on the front wall. How cool. Band aids that look like strips of bacon. Thanks to Peabody for highlighting this and other novelty bacon merchandise. These are surely a must for the hospitality industry. Get rid of those bright blue things and shove a few packs of these in the first aid kit. If it accidentally slips off your scabby finger and into a plate of baked beans, the punters will hardly notice... "hmmm, not bad, but the bacon was a bit chewy"
Joe's Garage, at 366 Brunswick Street, Fitzroy, Tel +61 3 9419 9944, was the first real hit for restaurateur Paul Mathis, who has since gone on to many bigger and better things (like setting up restaurants in pretty much every square inch of Fed Square, excluding the toilets). It was also the title of a triple-album rock opera by Frank Zappa, in which a nice boy called Joe, having paid lots of money to L. Ron Hoover and the Church of Appliantology, is diagnosed as a latent appliance fetishist and instructed to go into the closet and hump some vaccuum cleaners. Maybe Paul Mathis is a Zappa fan? Tom Cruise almost certainly is not. Call me cynical, but more than a decade after the Joe's Garage glory years, I was almost expecting disappointment. So I was pleasantly surprised to find the place buzzing happily along, with good food and snappy service. My serve of scrambled eggs with avocado and chili wasn't bad (the avocado was still a bit hard), and the sides of bacon and hash browns were excellent. I would, however, recommend an upgrade to the toast, which was a rather bland light rye, light brown, or something similar. Joe's seems to have two signature breakfast dishes. First, the Joe's Big Breakfast of eggs Florentine, mushrooms, tomatoes and a lamb sausage (or sausages, I'm not sure which). Second, Joe's "Legendary" Pancake, with berry compote, lemon and sugar, or banana and honey. The menu warns of a minimum 20 minute wait for this latter dish. Presumably this is the time it takes to rob a bank to pay for the bananas.